We don’t eat a lot of fast food or takeout. It’s just not in the budget. We’re looking at a good $25 bucks just to eat at McDonalds. And I can buy a lot of groceries with $25! Every time we go, I sit there and think how many meals I could make if I’d spent that same money at the grocery store. Anyway, when we do go for fast food, the kids always want Mexican. But Ima tell you what, ordering Mexican food, with all the different variables and options, at the counter for five people will make you want a shot of tequila. Or three. Can I get 6 burritos? Four chicken, two beef. Sour cream on one of the beef ones. No lettuce on two of the chickens. We only want tomatoes on three of those – the two without lettuce and the beef one without sour cream. No beans on any except the beef one with tomatoes. Does rice come in those? Is it hot in here? Where are the kids? Did Brutus leave with that hairy man in the trench coat? 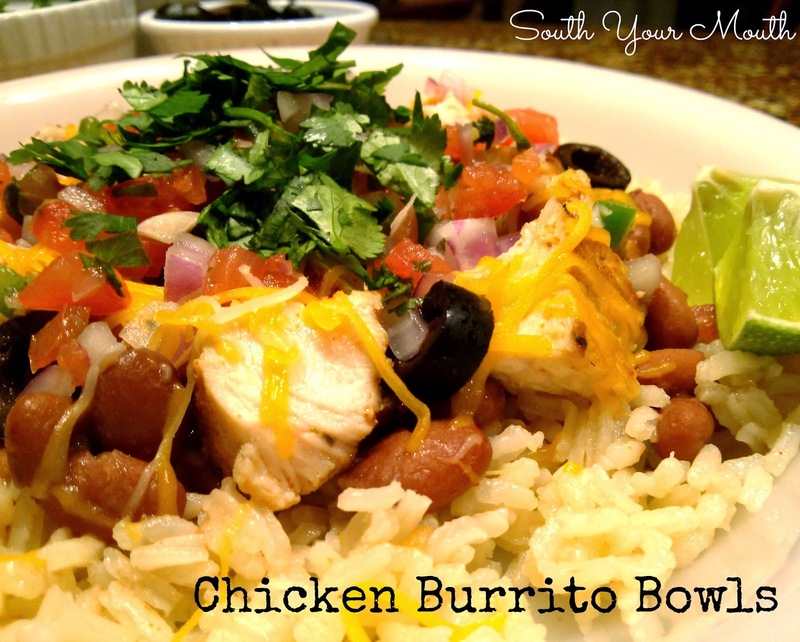 So I decided to make it easier and cheaper and make my favorite type of burritos – burrito bowls! You could easily serve all these ingredients in a flour tortilla as well, but y’all know I love me some rice! Add chicken breasts, fajita seasoning and vegetable oil to a large bowl and toss to combine (I used my hands). If your chicken breasts are super thick, slice them into two thin cutlets (or buy cutlets if available). Heat a large skillet over medium-high heat. Add chicken breasts to skillet and cook in a single layer for about 5-7 minutes on each side or until chicken is cooked through. Cook in batches if necessary to avoid overcrowding the pan. Let chicken rest 5 minutes then cut into bite-sized pieces. To assemble bowls, add a layer of rice, then beans, then chicken, then cheese. Top with toppings of choice. I served everyone a prepared bowl of rice, beans, chicken and cheese and set the table with all the toppings so everyone could add what they like! Sauté rice and onion in butter over medium-high heat for 3 minutes. Add garlic and continue cooking until rice has started to brown and gives off a nutty aroma (about 5 minutes total cooking time). Add rice, broth and chili powder to a 1-quart baking dish. Salt to taste if necessary (you want the broth to be as salty as you want your rice). Cover dish with a fitted lid and microwave on high for 10 minutes. Reduce heat to 50% then microwave for an additional 10 minutes. Fluff rice with a fork before serving. *You can also cook, covered, in the oven at 350 degrees for one hour or on the stove for 20 minutes on medium-low, stirring occasionally. I think this will be dinner one day this week! Also, I'm glad I'm not the only one who silently calculates the groceries I would buy with dining out dollars! You can really make this stretch to feed 6 people, but I'd say this makes 4 healthy servings. Love your recipes, they remind me of.what we ate growing up :-) Where is the share button pinterest? Thanks! Hover over the photo... it'll pop up near the center. I'm so glad you shared this. When I saw the photo I immediately thought of Chipotle...and their expensive burritos. You are too clever by far! This is a wonderful dish to have as a easy dinner, sure to please everyone. Put bowls with rice and chicken out on table and they can choose their own toppings, neat idea! I also am one of those people who calculates the $$$$ behind eating out, thank goodness I'm not alone. I made this dinner tonight. Absolutely delicious! This is now a regular in our dinner rotation. I have a bunch of picky eaters and this is one of their favorites!! Everyone gets to make their burrito bowl just the way they like it. We set it out like a buffet and everyone gets to make their own creation. Mandy, thank you so much for making my dinner time so much easier. I adore your blog and your recipes! !